We have a bumper crop on our potted lemon tree. In its first few years it only yielded a few lemons. Now it is flourishing. I never use lemons in huge quantities, particularly as I don't like sweet lemon desserts, so I am scratching around for ways to use them up. Which means I am prompted to try recipes that intimidatd me. Like baked almond feta. Yes, I mean vegan cheese! 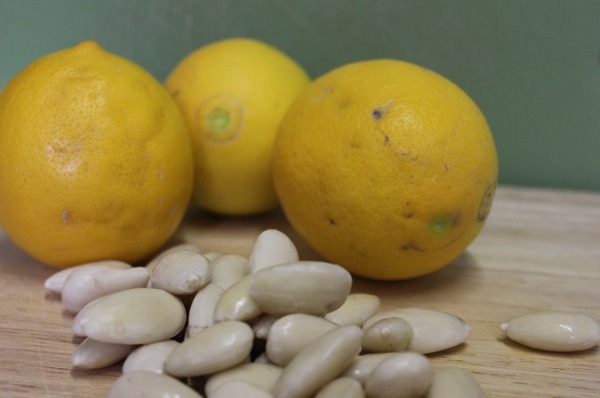 To see my lemon photos you might think that this recipe uses lots of lemons. I was disappointed to find that 1/4 a cup of lemon juice only requires 1 lemon. So I added a little more. I have plans for a lemon cake and to give some away. It never rains, it pours! Lemon dilemmas aside, I am quite taken with the idea of vegan cheese. If only they didn't take so long to make. I soaked the almonds for 2 nights because I didn't quite get around to making the feta after the first night. I did a lot of other things instead. Like baking a honey and oat bread (which I intend to post about later). I planned that last night's dinner would be a simple affair of bread, 'cheeze' and vegetables. Even so, I was cutting it fine. I barely managed to get the cheese into the cheesecloth and get out the door for Sylvia's swimming lessons. It didn't hang quite as long as the recipe said but I think this didn't do any harm. I patted it into the baking dish not long before dinner - with Sylvia helping. If she had had her way she would have made lots of holes in it. (Or 'oles' as she likes to say because suddenly she has lost her 'aitches'.) She tried a teensy weensy bit of the cheese and decided she didn't like it. At least there was something for her in the side dishes. She loved the roasted cauliflower, the peas and carrot sticks. She had the tofu bacon without the fried cabbage. Sadly for me, the pumpkin took too long to roast and sat in the fridge instead of our tummies. It has been very good in a sandwich today with leftover cabbage and cheeze. E and I were very pleased with the cheese. It was very crumbly, but so is feta. If anything, it could have had a bit more bite. I am glad I added the extra lemon juice and I think next time I will add a bit of extra salt (like Ricki does). Not perfect but as Celia says, "the true secret of successful cooking lies not in ingredients and recipes, but rather in experience and practice.' I highly recommend reading her whole post on Celebrating Failure. This was no failure but it deserves some practice to be at its best. I am sending this to Laura of How to Cook Good Food for the One Ingredient: Lemon Challenge. Oil a small baking dish and place almond mixture into this. We patted it down with our hands. Bake at 180 C for about 40 minutes until golden brown and showing some cracks. Serve warm or at room temperature. Store in the fridge. 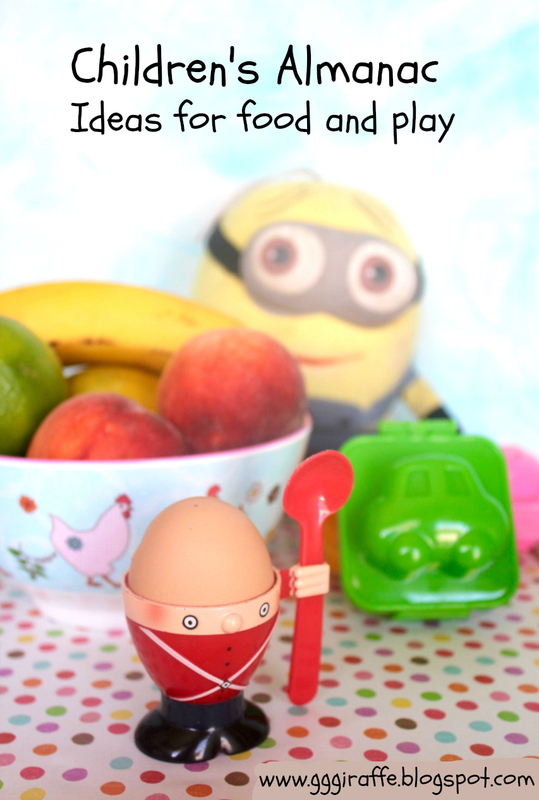 I feel like I may well slip behind in blogging as I have so much to occupy me lately. We are racing through our DVD of Downton Abbey, I finally have a Pinterest account and work is really busy. Yet there is so much good food to share that I need to blog some of it. Today Sylvia and I have been drinking smoothies made with quince poaching liquid, I have baked bread, made a lovely stew and have almonds soaking for some vegan feta. Yet one of the best things I have made lately is this batch of chocolate macaroons. I can't think of macaroons without remember my Grandpa who loved them. In fact, the only macaroons I remember eating in my childhood came from him. Despite the sentimental connection, I am not so keen on baked goods that are loaded with egg. So a vegan version of macaroons is just my thing. Except that I am not vegan so I feel free to use honey for the sweetener. 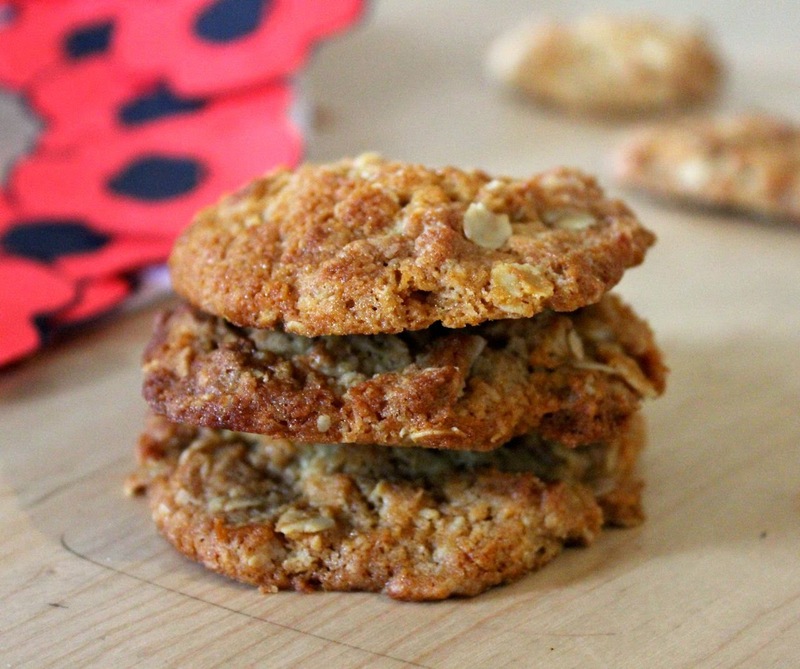 I found a healthy macaroon recipe and then remembered the macaroons from Ricki Heller's Sweet Freedom that included ground almonds and tahini. I combined the two and got what is already a favourite biscuit. We have a strong genetic history of sweet tooths in my family. Both my grandfather had and my dad has a stash of sweet foods. I then married a man who also has his sweet stash. So it is no surprise that while Sylvia can be fussy with her savoury food, she is a lot more likely to like sweet foods. These macaroons are no exception. If I had made them during the day she would have pulled a chair up to help before I had the ingredients out. When I made these macaroons last week I was in need of chocolate by the end of the day. It had been a busy day. We went to the pool where Sylvia was very proud of herself. Using a noodle (aka a flotation device) she was able to kick her way through the water! I think we call that swimming! Lunch was at Trippy Taco in Collingwood - the Tofu Asada Burrito was nice but not great. Hopefully we will get there again to try other dishes. We went to a floor covering place because at the moment the lino in our bathroom is gaffer taped together (long story)! Next it was off to the shops where I tried on some new clothes with Sylvia wedged between my legs to stop her escaping out the gap under the door. At home she wouldn't eat dinner. Then she made herself up a bed on the floor out of cushions and decided she would sleep there. Oh no! I put her to bed and made these macaroons! She loves to ask me "Are you a good witch or a bad witch?" You may recognise this question - it comes from The Wizard of Oz. Her favourite place is on windy castle or windy hill (aka the back of the sofa) where she likes to jump or be a shopkeeper. Far better there than deciding to sell off my crockery from the cupboard! She loves to sing "The Sound of Music" as we wander through the shops. Her sense of time is still developing. She loves talking about "last day" or "next day" or even "annunna day". Last week she told me "when I was a big girl I played with those bigs girls." Um, no. That would be her plans for when she is a big girl. However I hope she wont be playing with the girls she referred to because they were shop window dummies. She had her first haircut at a hairdressers today. They asked quietly if she would like a lollypop. I said no. The next place we went to she was given a lollypop anyway! Sigh! She was delighted. It got "lost" rather quickly. Another amusing conversation was on the way to work when she was questioning me about why was I going to work. Finally after some discussion I told her I go to work to be paid and then I spend the money at the shops. There was a long silence. Then she said, "that's amazing!" A few days later on a slow morning when I told her I had to get to work or I wouldn't be paid, she said "well you just go to the supermarket and they will pay you money". Does that mean she was amazed I went to work for money when I could just go down the supermarket for money? I have caught her a few times "doing the dishes" in the bathroom. Sweet, yes. However I would prefer she doesn't wash my toothbrush in soapy water! When we were down the street today someone asked her what her name was. She answered "Dolly's mum". She is really into sticky tape, the hole punch, scissors, pens, making presents and whatever other mess she can create! She is not that interested in cleaning it up. It seemed an appropriate post to give some updates on sylvia because she loved these biscuits so much. We all loved them. E thought them not sweet enough at first but then they grew on him. They were wonderful work snacks for both of us. I loved the combination of honey and tahini which reminded me of halva, though the texture is more like my favourite grubs. They are not like your regular macaroons but they are pleasingly chewy. Finally in one of those odd coincidences, I noticed that the biscuits had the same look as my cardigan that I had bought that day. Now that gives a new twist to the saying, you are what you eat! I am sending these chocolate macaroons to Amy's Slightly Indulgent Tuesdays. Line two baking trays with either baking paper or silicone mats. Preheat oven to 180 C.
Place dry ingredients into a largish mixing bowl. Add wet ingredients and mix well. Dampen palms and roll walnut sized balls, then flatten slightly between palms and place on baking trays. Bake for about 10-12 minutes until dry to touch. (I baked mine at 190 C for 11 minutes to make amends for my oven's vagaries). Cool on the tray - they will be very fragile when warm but easy to handle once cold - though you may need an eggflip or spatula to prise them off the silicone mat. Ours kept for a week in an airtight container. A couple of weekends ago, on Mother's Day, we had a busy weekend that seemed to have a common theme of beetroot running through it. It started with a visit to the Collingwood Children's Farm where we bought the beetroot that was then taken to Geelong and back to Melbourne and ended with beetroot soup. After buying as much food as our wallets and bags could bear, we wandered around the farm to look at the animals - pigs, cows, sheet, ducks and chooks. Sylvia loved them - though she was a bit freaked out when she and E were surrounded by hens who were very interested in the leafy greens poking out of our bags. Sylvia and I also enjoyed talking to a lady spinning wool about what sort of spindle would the Sleeping Beauty have pricked her finger on. I didn't take out my camera until after we left the food stalls so I am sharing a photo of beetroot from the Preston farmers market. Those with an eye for detail might notice it is golden beetroot. I used regular purple beetroot in my soup but I can imagine it would have been stunning with these cheery yellow beets. As we were staying at my parents' home in Geelong that night, we took down some of the food we bought - ciabatta, beetroots, apples, cherry tomatoes and Wensleydale cheese from Maffra. (I also shared some of my quinces with my mum). The next day we went to my niece's first communion mass. My mum made vegie muffins and pancakes to eat after the service. Warming food was very welcome after the deluge that hit us upon leaving the church. (Luckily Sylvia had just been given a snuggly coat that her cousin Grace had once worn). After brunch we didn't mind a late lunch. It was a feast consisting of baked beetroots tossed in a little horseradish, crispy roast potatoes, amazing roast carrots, biryani, yoghurt cucumber sauce, green salad, and bread. My dad participated in the Mother's Day spirit by doing the dishes. I was pleased that Sylvia ate some of the beetroot both at lunchtime and when we took the leftovers home that evening. Fortunately we had plenty because I had plans for the rest of the beetroot. I decided to make a smoky beetroot soup with some of my tofu bacon. The recipe I used was for a carnivorous soup. I was curious to see how the tofu bacon would go in it. Firstly I discovered that my experience of having tofu bacon crisp up nicely must have been because I usually use a good Scanpan non-stick frypan. When I tried it in my heavy bottomed saucepans it either burnt the bottom or didn't crisp up. I don't think this mattered so much for this soup but I will need to remember it in the future. The jury is still out on if it is possible to put facon in soup. Pros are that it adds protein as well as flavour but cons are that I am not sure about the texture. Would it be better to just have added silken tofu and flavourings separately? What I loved was adding some fried tofu bacon at the end. That was exactly the sort of texture I love. Add carrot and celery and continue cooking for about 5-10 minutes until vegetables are softened. Add potatoes, salts, liquid smoke and water. Check taste (remembering the baked beetroot will sweeten it slightly) and then bring to the boil. Simmer for about 15 minutes. Add beetroots and simmer another 15 minutes or until vegetables are falling apart when a fork goes through them. Stir in nutritional yeast flakes, lemon juice and season to taste. Serve with some tofu bacon sprinkled on top. Today was filled with craft with Sylvia, an auction next door and a birthday party. I had planned to post a recipe. Instead I have decided to share an alphabetical list of 'me' words. Choclette asked who would join her in jotting down "26 words that are meaningful to me". I put up my hand because I love lists. I originally intended to write some explanatory text beside each word. Then I decided to be unusually brief and just write a list of 26 words. Most of them are explained elsewhere in the blog or may well be in the future. Join in if you will. It is a wet cold day. Not enough time to write up some recent recipes. 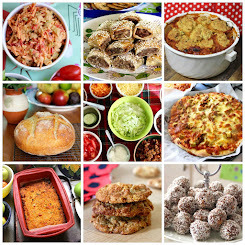 Instead, let's have a look at some of the food and fun that has graced my kitchen recently. Above are some retro soup bowls that I found at a local op shop. They look just right with Split Pea Soup and a slice of Babka Vegetable Bread. I have recently jumped on the chia seed bandwagon. So I was excited to see that Vita Wheat have these crackers with sunflower seeds, oats and chia seeds. They are delicious but they are big. I sometimes wish they came in smaller portions. Another favourite snack is ChicNuts Roasted Chickpeas (sold in Woolworths but not Coles supermarkets). They are crunchy and terribly moreish. I love the boxes of eight small bags of chickpeas. Not great for the environment but so handy to throw in my bag when we are out and about. Particularly as Sylvia loves them. Sylvia has suddenly taken an interest in numbers and letters. She knows that 3 is her number (because it is her age) and now recognises it. I did this sticker sheet of numbers for her for fun. My aim is to get her to learn the numbers on the clock so I can speak to her about the time (eg we are leaving the house when the big hand is on the 3 so you need to get ready!). I have recently fallen in love with Whittaker's chocolates. Usually we buy the dark one but occasionally we get this coconut block that reminds me of the circles of coconut rough that I loved as a child. Strangely enough it is only recently that I have recognised and embraced my love of coconut. Sylvia chose this Go Natural Apple Apricot and Banana Popcorn and Fruit Bar. (Is that title long enough?) She had half a bar this morning. As you will see from the apple in the background, she often fails to finish what she starts. They are better than I expected. The popcorn is sweet and soft but the dried fruit is really chewy. I quite like the textural contrast. 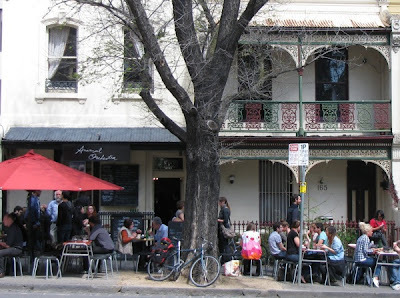 One of my favourite places for a decadent purchase is Gewurzhaus in Lygon Street, Carlton. It is a beautiful shop to browse. I love smelling all the amazing spice mixes. My favourite is French Lavender Salt. They have a set of weathered wooden drawers where I found ground wattleseed. I have this Viennese Christmas Sugar that seems too precious to use and yet it is too gorgeous not to be used. And lastly here is tonight's dinner. An eggplant and pepper paste stew that my mum brought me (along with some lovely fig and walnut bread). I added a tin of beans and a little tahini. We ate it with rice and green beans. Delicious! I am sending to this Celia of Fig Jam and Lime Cordial for her In the Kitchen event. I am also sending the split pea soup at the top of the post to Jacqueline for her National Vegetarian Week recipes. That is the British National Vegetarian Week which runs from 21-27 May 2012. I didn't quite follow the recipe and it reprimanded me soundly. Anh simmered her quinces for 4 hours. I followed the recipe that the nice man at the farmers market gave me and simmered mine for 30 minutes. I had intended to bake mine. Then it was all too much. Sunday was a day when I was lacking on energy. Poaching the quinces on the stovetop seemed so much easier. It seemed fitting that I began preparing the quinces while E and Sylvia ate crumpets and watched royal documentary, The Diamond Queen and we ate the last piece with a cup of tea while watching Downton Abbey. This is a cake that would be at home at high tea time in a grand house among bone china and corsetted matrons. In fact I would go as far as to say it is one of the more impressive cakes on my blog. Impressive often means fiddly. I started this on the Sunday night when I trimmed, peeled, chopped and poached the quinces. I liked Anh's suggestion of adding the quince skins in a muslin bag to the poaching water for extra flavour but I had a huge pile of trimmings and just didn't have it in me to be so organised. I made the cake on the Monday night in stages between hunting for Dolly (who was hiding in a shoebox), telling Sylvia a story (about a little girl called Sylvia who stays up all night and is ready to sleep when it time to get up) and carrying Sylvia back to bed when she appeared in the kitchen. I almost felt mean to arrange the remains of the quince slices on the cake. I had fed a few to Sylvia who just loved them. I was glad that I started the cake as early as possible. After the first 50 minutes at 165 C oven, my cake looked like uncooked batter peeking through the moist quince slices. I put it back in to cook further at 180 C for 35 minutes and let it cool in the oven with the door ajar. It smelt wonderful but it was too late to sample a slice. The next morning I discovered a large slick of melted butter on the bottom of the oven. Even so, I really really wanted a piece for breakfast. Instead I exercised amazing self control and took the cake to work where we had a morning tea. The feedback was most complimentary. Such praise was all the more welcome for overshadowing the hassle of finding that my car wouldn't start and needed a new battery. I took the leftover cake to a meeting that afternoon and jealously guarded the last wedge to take home to where my mum was looking after Sylvia. E and I shared the last small piece last night. The cake was an astounding success. 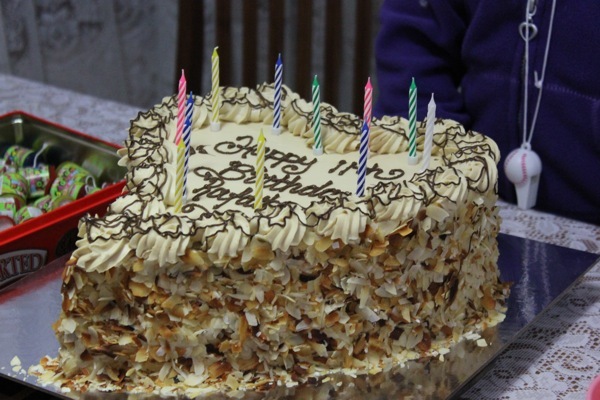 It wasn't the same glorious yellow and deep red of Anh's cake. Yet it had a marvellous soft crumb that was barely sweet. Quite rightly the cake allowed the fragrant and subtly spiced quinces to shine. I was pleased and relieved, given that it didn't go according to plan. It was only after finishing the cake that it twigged that I added 300g of butter rather than 185g. No wonder it tasted so good! But it is a reminder as to why I shouldn't bake while getting Sylvia to bed. Even without the extra butter, I am convinced this is the best quince cake I have come across. Browsing for other quince ideas couldn't turn up any cake recipe that was more tempting. Though I am still interested to try the quince and gorgonzola salad posted by Cindy recently. I am sending this cake to Jacqueline of Tinned Tomatoes for her Bookmarked Recipes event (originally founded by Ruth from Ruth's Kitchen Experiments). Five years ago: Choc Chip Cookies go Bananas! Preheat oven to 165 C. Grease and line a 22cm springform cake tin. Beat butter and sugar until creamy. Add eggs one at a time. Gently stir in almond meal, flour and vanilla. Spoon into prepared tin and smooth with the back of a spoon. Arrange quince slices on the top of the cake. You may not have room for quite all of the slices. Bake for 50 minutes or until cake is golden brown and set. (The cake will poke through between the quince slices once set - as in notes above, I baked mine much longer but I think this is due to accidentally putting in too much butter.) Cool in the tin. Remove the side of the springform tin and serve in wedges. Trim and peel quinces. Quarter and remove cores. Slice each quarter into 3 or 4 slices. Pile into medium saucepan and add remaining ingredients (I pushed the cloves into a lemon quarter so they were easy to remove. Bring to the boil and simmer for about 30 minutes or until quinces are soft. Discard cinnamon quill, lemon quarters, and cloves. Set aside vanilla bean. Cool quinces in poaching liquid. I left mine in the saucepan overnight. Serve in poaching liquid or strain quince slices for above cake and save liquid for smoothies, crumbles or just to drink straight. If this were a university assignment I would fail. I know a blog post should only be 250 words and focused and not filled with so many photos that you think it will never end. If you want short and sweet, this isn't the post for you. 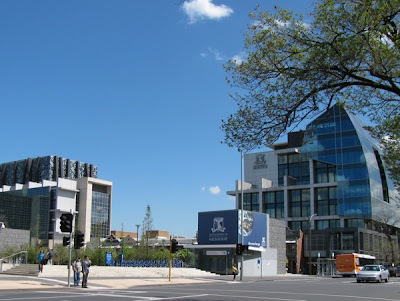 If you want an ode to The University of Melbourne, filled with meandering memories, plus some rambling recommendations on where to eat on campus and its fringes, bear with me. Just don't expect to find recommendations on coffee, as I don't drink the stuff. This post has been some time in the making. I started taking these photos a year ago. But my associations with the university go back far more years. In fact, my first memory of the university is in the above 1888 Building. (No prizes for guessing when it was built!) I still remember playing drawing games at child care here when it was known as the old Melbourne Teachers College and my mum studied here. These days the building is more notable to me for the magnificent Gryphon Gallery with its beautiful stained glass windows. The historic buildings are where my love of the university started. I still love to wander through the campus and admire the hotch potch of buildings that have seen so many students. 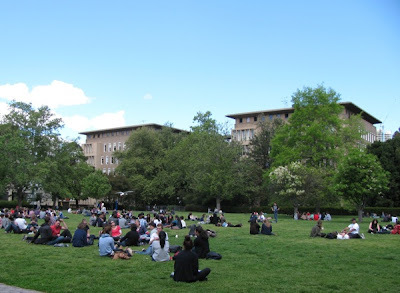 At school, I chose to study at the University of Melbourne because I wanted a place steeped in tradition. The foundation stone was laid in 1854, not long after Europeans had founded the town of Melbourne. It was built with gold rush wealth and made an important statement about the sophistication of the new town. For over a century it was the only university here. I will not bore you with the politics of prestige, the Group of Eight and the pompousness that comes with it. Suffice to say, I have studied and worked here long enough to see the good and the bad. Whenever I have cause to wander through the campus, I still love to go through what I have always known as the Old Law Quad. It is much photographed with brides in large white dresses and graduates in gowns and capes. In fact I had my own graduation photo taken there. If you look at the University website it will tell you it is called the Old Quadrangle and that it now houses Philosophy, Classics and Archaeology. In my day it was the home of the Law Faculty. They now reside in one of the fancy new buildings south of the main campus. The Quad was commenced, in Tudor Gothic style, in 1853, the oldest building on campus. Its final wing wasn't completed until 1970. A plaque on the wall of the quad points to its place in the broader history of Melbourne: "In April, 1856 stonemasons working on the building, downed tools, marched to the city and inaugurated a movement which won the Eight Hour Day for building workers in Victoria. The victory became an international landmark in the history of the labour movement." A glance around the campus, however, will demonstrate that the history of buildings i not always straightforward. Take the Old Commerce Building above where the Architecture Faculty now resides. It was actually built in 1941 with a facade taken from the demolished Bank of New South Wales on Collins Street. Authentic? Well the National Trust have listed it. I suspect today we would treat it very differently. Seeing how it was done in the 1940s gives an insight into another era. Another fascinating integration of old and new architecture is this entrance to the Underground Car Park. The archway, flanked by Atlas statues, comes from an old doorway in St Stephen's Green in Dublin. The carpark is famous as one of the film locations for Mad Max. On a more personal note, I remember seeing a student play set in there. It brings back memories of student days when I saw far more plays than I do now, including many student productions. Ah, the student lifestyle! Living close enough to walk or bike to classes. Hours spent in the library, not always studying. Endless cups of teas and intense conversations about life, the universe and everything. Discovering authors, music, films. It is no longer my lifestyle but I still catch glimpses of it on campus. Student chalking messages about balls and events on the pavement. Queues of students for bbqs with free beer. Advertisements for plays and gigs on bollards and the banners outside the student union building. While it can seem unchanging, the University seems to be in a constant state of flux. Last year I went to Bullwinkles stationery store that had been there since I was a student. I discovered it had closed and a new stationery store had opened in the basement of the student union building. This happens every now and again. The Bailieu Library and Educational Resource Centre (ERC) are barely recognisable to me any more. The internet means that knowledge is managed very differently now. It has changed the way students enroll and submit essays and communicate. Even buildings no longer have the same uses. I always loved that the above Babel Building was the location of many language schools but apparently this is no longer so. And don't get me started on the introduction of Voluntary Student Unionism! I have spent far longer here as an employee than as a student. In fact my two longest jobs have been at the University. I no longer work there but I have worked in a laboratory, in student services and in a research centre. This is how I know it is called the University of Melbourne not Melbourne University. I also learnt of the difficulties of implementing university-wide databases (such as THEMIS), how to work with Asian names (a great short course), and to have a healthy cynicism for peer review and journal impact factors. I would like to tell you that I know all there is to know about where to eat. But like the rest of the place, the food offerings keep on changing. For years the Middle Eastern place in the Student Union Building food hall had these fantastic cheap chocolate balls that I loved but they seem to have disappeared. So have the nice people at my bank at the university who used to know my name and give me money even if I left my purse at home! One constant is the Melbourne University Food Co-Op tucked away on the first floor of the Student Union Building (apparently now called Union House). I was a member there in my student days and used to work behind the counter. I loved the cheap little salad rolls - they were usually tomato, grated beetroot, grated carrot, alfalfa sprouts with a choice of spreads such as peanut butter, tahini and hummus. The pies were lovely too with lots of hearty fillings and wholemeal pastry. Above is a recent tofu and tempeh pie. The co-op still has a bulk food section too. Another staple of student life and the Melbourne lunch scene is the freshly made salad roll. The above one, from Bouverie Deli at 154 Bouverie Street, is typical. Lettuce, sliced tomato, grated carrot, tinned beetroot slices and sliced cheese. Such sandwich bars are not hard to find. There is one in the Student Union Building food hall and probably others if you care to look. They are cheap and healthy, though I prefer them in summer than winter. This vegetable calzone with cheese is more my sort of winter lunch. It is from the Italian counter in the food hall. The food hall in the student union building has a wide selection of cheap food. Not all is brilliant. I have been let down by the rotis at the Indian counter. Upstairs is a bar where I have eaten occasionally but I think it has changed hands more recently. If I don't buy a salad sandwich or calzone, I usually stroll down the hallway from the food hall to get sushi at Plush Fish. Plush Fish is also very good for sweet food. They do lovely muffins and hedgehog (above). Other sweet food in the Student Union Building includes a lolly shop, bubble drinks, doughnuts and French pastries. Other small places do some lovely slices. Just recently I had a lovely chocolate caramel peanut slice at what I think is called Romano's Coffee by the ERC Library. This place also does great salads. The problem with the University is that the Parkville campus is such a cluter of tiny lanes and buildings, that it is hard to given directions. Another place I have recently enjoyed is the Potter Espresso Bar (run by Blueprint Catering). I didn't take my camera because I am quite shy about being snap-happy with work colleagues. It has a nice range of panini, salads and pasta. It is also easy to direct people to. More notable though is the adjoining Ian Potter Gallery of Art. I love the artwork on the facade called Cultural Rubble by Christine O'Loughlin (see above). I was under the impression that they were rejects from the Louvre's collection but in writing this post I found it was actually made out of plaster cast moulds of the originals. The Potter Gallery is worth a visit. It has interesting exhibitions and you can always see the stained glass windows salvaged from the grand Wilson Hall that was burnt down in 1952. When I have had time, while working at the University, I have enjoyed a little oasis of calm and culture every now and then. In addition to the Potter Gallery, there is the Grainger Museum, the recreational Roden White Library, the Systems Garden, and the Medical History Museum. The medical museum fascinating for its installation of a nineteenth century London pharmacy. It was also the museum where as a student I assisted a researcher to curate an exhibition on this social history of venereal disease. When the sun shines there are lots of lovely places to sit and eat. Above is the South Lawns in front of the John Medley Building. Not my usual haunt. I'd much prefer the seats by the Old Arts Building or the shady courtyard at Tsubu Cafe. Or the outside tables at Lot 6 - at the bottom of the stairs by the ERC. I particularly loved a recent lunch there of avocado, baby spinach, cherry tomatoes and goats cheese on sourdough toast. I have also eaten at University House and Graduate House, though not being a member of either. The former is ok downstairs but far more impressive if you eat at one of their function rooms. As I have mentioned it has taken me some time to write this post. So long that when I recently went past this stand behind the John Medley Building it had changed. Crepes a la Carte is a fascinating example of student entrepreneurship. It was started with a grant and since its beginning in 2010 already has expanded the premises. I stopped here some time ago for one of the surprisingly thin crepes filled with nutella. It was rather good and I have been meaning to return and try some of the other fillings such as melted chocolate and coconut or nutella and peanut butter. Along with the buildings works in Carlton have been an explosion of cafes to accommodate the academic community who have moved into this area. Baretto sits at the bottom of the Alan Gilbert Building, Porta Via at the Law Building, Tre Sette at 139 Bouverie Street and Briscola at 157 Pelham Street are ones I have visited regularly. I love the soup and salads in Tre Sette and at one stage ate a lot of Briscola's toasted panini with mozzarella, pesto, rocket, eggplant, red capsicum and zucchini. I even ordered one and took a photo (below) for old times' sake. They all do some interesting wraps and deliciious sweet bakes. One of the bright new cafes in the area is Animal Orchestra at 163 Grattan Street (opposite the 1888 Building). Unfortunately I have lost my photos of the fantastic mural of magazine clippings that adorn the walls but you can see then at the link in the previous sentence. The top photo is the exterior of the terrace house where it is located. I love their soups. They always have a vegetarian one, though sometimes a bit spicy. Below is a photo of a takeaway soup I had at my desk with a florentine. Their biscuits are great and so is their vegetarian pizza. The staff are friendly and I love their quirky old furniture in the best of student traditions. They even have an upstairs room for private gatherings. Below is my lunch I had last year at Seven Seeds at 114 Berkeley Street with fellow blogger Catherine of CatesCates. It is on the university fringe so I decided to include it before I discovered how long this post would be. I had a sandwich with pumpkin and herbed fetta with a side of rocket. It was very nice but rather pricey. That didn't stop us both having to try one of the amazing cakes. The brownie was divinely decadent. The cafe is in an old warehouse and was busy and hipper than thou. Only to expected in this neck of the woods. Finally, I can't mention university food without at least acknowledging pub life. As a student I spent quite some time at The Clyde and Naughtons but I only remember the beer rather than the food so I can't comment on lunch there. These days I prefer my food to my drink. 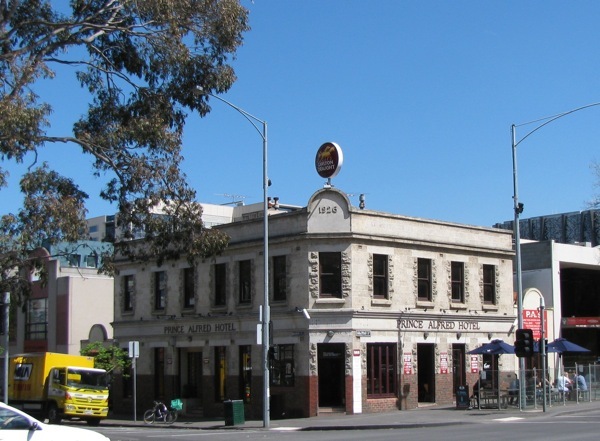 Below is a photo of the Prince Alfred Hotel on the corner of Grattan and Bouverie Streets - better known to the regulars as PAs. It is a great place to go for a group lunch. Vegetarians can get decent pub grub classics such as burger and chips or veg pasta. It can get very full of students during semester but takes bookings. In addition to a wealth of places on and around campus, the University of Melbourne is blessed with a close proximity to Lygon Street and the city. 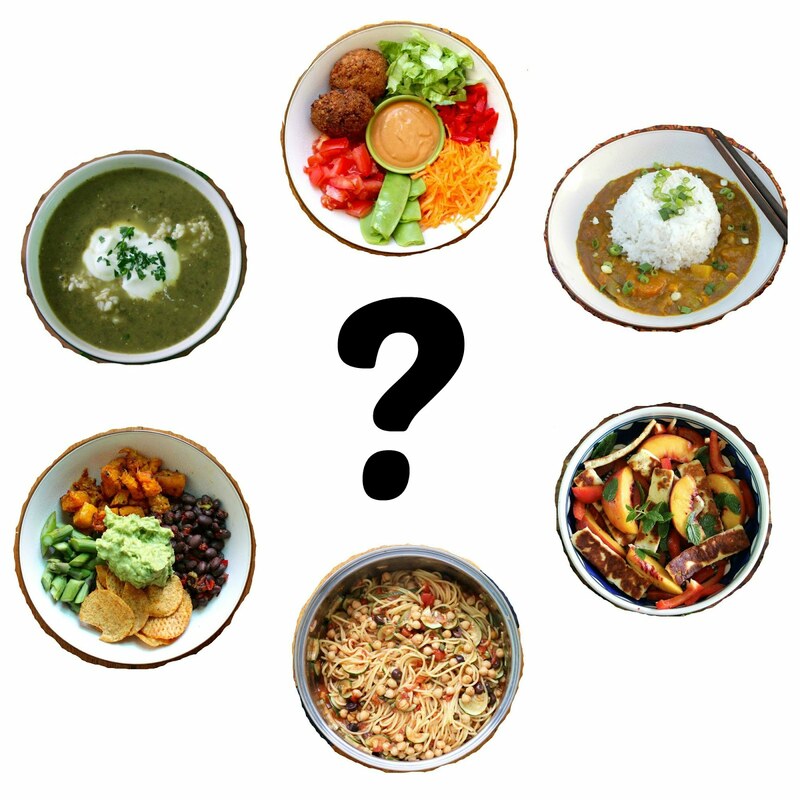 As you will see from this long post, the biggest problem in finding somewhere to eat is the tyranny of choice. Oh and you must be wary about what you say because chances are that one of your colleagues will be sitting nearby. Recipes and reflections in which our vegetarian heroine dreams of being tall and graceful as a giraffe; being a goddess in the kitchen; and being gladdened by green gadgets, green food and green politics because green is the colour of hope. See About Me for more info. 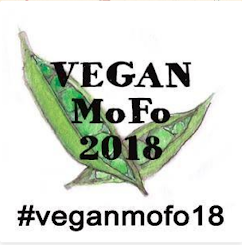 My blog went vegan in September 2018 for Vegan MoFo. This was my 6th year of doing Vegan MoFo. 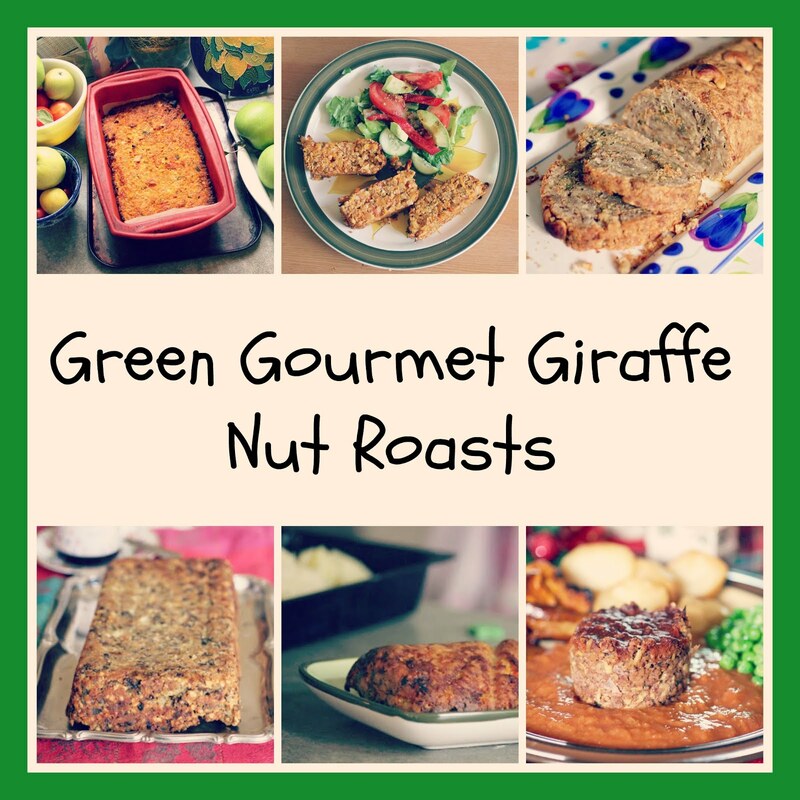 I am very fond of nut roasts and have posted over 30 nut roast recipes. Click on the image for information about nut roasts and links to my nut roast recipes. What will I cook today?